Oakland Athletics' Stephen Piscotty looks up as he arrives at home plate after hitting a home run off Boston Red Sox's Eduardo Rodriguez during the second inning of a baseball game Tuesday in Boston. 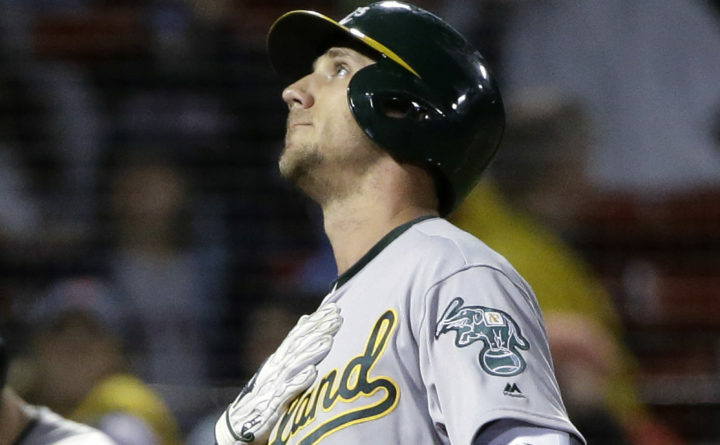 BOSTON — With a hand on his heart and a quick glance to the sky, Stephen Piscotty made an emotional salute to his late mother and helped the Oakland Athletics win in his return to the lineup. Hours after being reinstated from the bereavement list and flying cross-country to join the A’s in Boston, Piscotty hit a towering home run out of Fenway Park in his first at-bat Tuesday night as Oakland beat the Boston Red Sox 5-3. “It was pure joy. It’s been an emotional week,” said Piscotty, whose mother, Gretchen, died May 6 after a one-year battle with amyotrophic lateral sclerosis, also known as Lou Gehrig’s Disease. She was 55. Piscotty had missed four games to be with his family as they grieved the loss and celebrated Gretchen’s life. He slowly made his way around the bases, then after rounding third placed his right hand over his heart and patted it with a glance to the sky. “Coming around third, I just immediately started thinking about my mom and kind of put my hand over my chest like she would do,” Piscotty said. Piscotty drove an 0-2 pitch from Eduardo Rodriguez out to left in the second inning. Piscotty’s third homer of the season was his only hit of the night and put the A’s up 3-0. Matt Chapman and Mark Canha had two RBIs apiece for the A’s, who took the first two games of the series against the struggling Red Sox. Red Sox: Placed RHP Carson Smith on the 10-day disabled list Tuesday with a dislocated pitching shoulder, which he injured during a tantrum Monday night. Smith was upset after Khris Davis led off the eighth inning with a home run to put Oakland up 6-4. … The Red Sox also recalled LHP Bobby Poyner from Triple-A Pawtucket.